Everything you ever wished for within the grasp of your fingers. Impossible you say? You clearly haven’t heard of Aurum, the contemporary smart home community brought to you by the renowned Space and Dhoot Group. Created for people seeking a lifestyle far above the ordinary, Aurum combines stunning architectural design, world class amenities, vaastu compliant flats along with the security of a gated community. It has everything you could wish for and more. 2 BHK - 906 sqft to 1035 sqft. 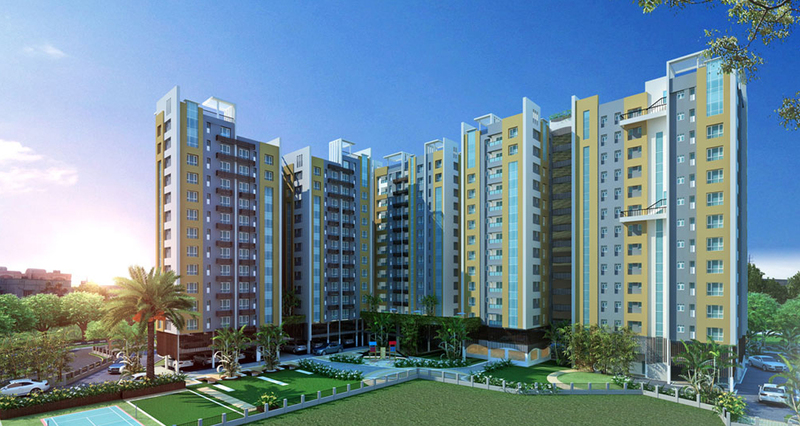 2.5 BHK - 1183 sqft to 1303 sqft. 3 BHK - 1373 sqft to 1595 sqft. 4 BHK - 1832 sqft to 1915 sqft. Interior conventional brickwork with plaster of paris. Exterior combination of cladding and or high quality cement/textured paint. Dado of ceramic tiles up to 2 ft. above the counter/platform. Electrical points for refrigerator, water filter and exhaust fan. Toilet anti-skid ceramic tiles for flooring. Sanitary ware of Parryware/Hindware or equivalent make. CP fittings of Jaguar/EssEss/Hindware or equivalent make. Door frame made of seasoned and treated wood. Main door solid core flush doors with decorative brass handles. Main door fittings Night latch and eyepiece. Internal doors solid core flush doors with stainless steel locks. Windows fully glazed anodised/powder coated aluminum windows. AC points in living, dining and all bedrooms. Cable TV, telephone point in living/dining. Adequate 15 amp and 5 amp electrical points in all bedrooms, living/dining, kitchen and toilets. Concealed copper wiring with central MCB of reputed brands. Modular switches of reputed high-end brand. Overhead illumination for compound and street lighting. Necessary illumination in all lobbies, stair cases and common areas. Stair and floor lobbies - kota stone/marble/tiles. Entrance ground floor lobby on each block-combination of marble, granite and kota stone. 24-hours water supply from captive and deep tube wells. Community hall,Toddlers pool,Gymnasium,Green manicured grass lawn, trees and flowers, Tot lots for children's play area, Indoor games room. Adequate capacity standby generator for common areas and services. Generator power load to apartments; 2BHK-500W; 3BHK-750W; 4BHK-1000W. In-house solid and water waste management system. Closed circuit TV at the ground floor level, with central security surveillance. All the important points duly manned by well trained security personnel/guards. Dunlop Crossing – 1.6 Km. Upcoming metro – 1.5 kms. Adamas International School – 500 Mtr. Sagar Dutta Hospital – 300 Mtr. Belgharia Station – 2 Kms.